Didn’t see this on the news, did you? So why does Feb. 29 come once every four years? This is so confusing. And thanks to climate change, the seasons are going to be off anyway in a few hundred years. True, he doesn’t speak like any other candidate I’ve ever seen. While others are scripted, Trump is freeform jazz. He’ll just say whatever pops into his head. Even if what he says and what they feel make absolutely no sense. Doesn’t make him right. Just makes him understandable. Interesting observation on a nonexistent place that has been around for decades. But the narrator is right. Other fictional superhero cities (Metropolis, National City) aren’t very distinctive. Gotham has a soul, though one that’s totally corrupt. Here are the striking exit poll numbers on two key Clinton demos in #SCprimary. It’s easy for Bernie to keep it close in states where there are no black people (Iowa, New Hampshire). But that’s not the real America. 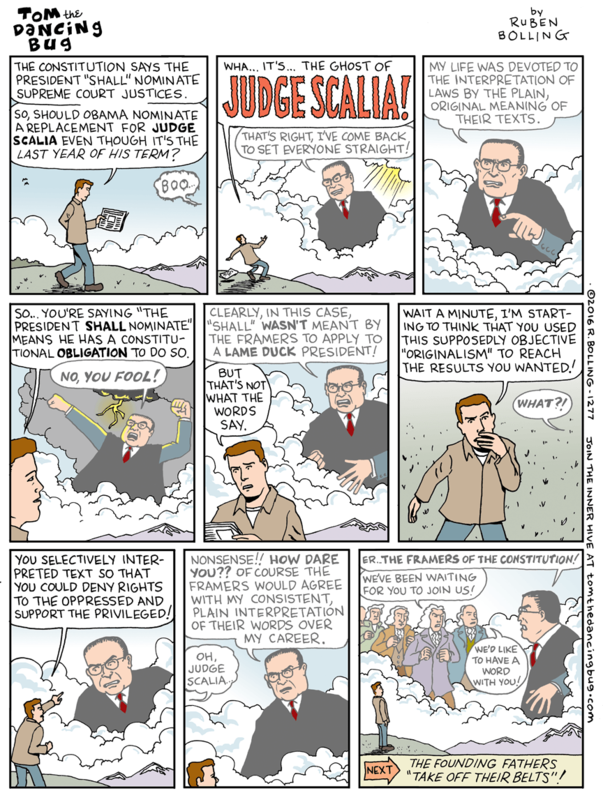 Scalia is dead. I want to see what’s next.